· Needle biopsy. After an anesthetic is given, the healthcare provider inserts the biopsy needle into the kidney to get a sample. Ultrasound or computerized tomography (CT scan) may be used to guide the needle. Most kidney biopsies are done using this technique. · Open biopsy. After an anesthetic is given, the doctor makes an incision in the skin and surgically removes a piece of the kidney. · Check how well a transplanted kidney is working. · Your healthcare provider will tell you about the procedure and can ask questions. · You will be asked to sign a consent form that gives your permission to do the kidney biopsy. Read the form carefully and ask questions if something is not clear. · Your healthcare provider may do a physical exam to be sure you are in otherwise good health. You may have blood tests or other diagnostic tests. · Tell your healthcare provider if you are sensitive to or are allergic to any medications, latex, tape, and anesthesia. · Tell your healthcare provider of all medications (prescribed and over-the-counter) and herbal supplements that you are taking. · Tell your healthcare provider if you have a history of bleeding disorders or if you are taking any anticoagulant (blood-thinning) medications, aspirin, or other medications that affect blood clotting. You may need to stop these medications before the procedure. · If you are pregnant or think you might be, tell your healthcare provider before the procedure. · You may be asked to fast before the biopsy, generally after midnight or at least 6 hours before getting anesthetic or sedatives. Your healthcare team will give you specific instructions. · You may get a sedative before the procedure to help you relax. Because the sedative may make you drowsy, you will need to arrange for someone to drive you home. · Based on your medical condition, your healthcare team may request other specific preparation. · You will remove your clothing and put on a hospital gown. · An intravenous (IV) line may be started in your arm or hand. · You will lie on your stomach so that the doctor can easily reach the kidney. A pillow may be used to hold you in the right position. If you have a transplanted kidney, you will lie on your back. · The skin over the biopsy site will be cleaned with an antiseptic solution. · You will feel a needle stick when the local anesthetic is injected. This may cause a brief stinging sensation. · You will need to lie still during the procedure. · Ultrasound or X-ray may be used to guide the needle into the kidney. · You will be asked to breathe in and hold your breath while the doctor inserts the biopsy needle into the kidney. This prevents movement of the diaphragm, which may interfere with the placement of the biopsy needle. · You may feel discomfort or pressure when the healthcare provider takes the sample. · There may be more than one puncture if the healthcare provider needs more than one tissue sample. If so, the same puncture process will be repeated. · When the needle is withdrawn, firm pressure will be applied to the biopsy site to stop bleeding. · A sterile bandage or dressing will be applied. 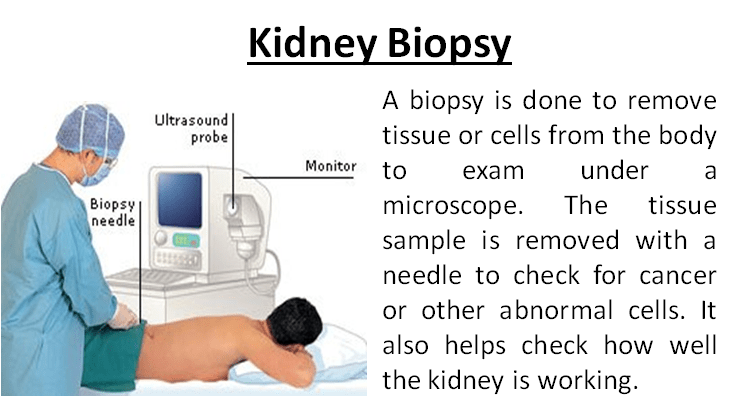 · The kidney tissue sample will be sent to the lab for testing. · Talk with your healthcare provider about what you will have during your kidney biopsy.